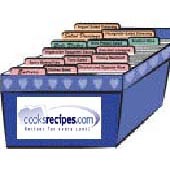 This pet food recipe for Molasses Dog Cookies was submitted by Diana Hatfield-Bixby. Combine flour, wheat germ, salt and almonds. Using a pastry cutter or your fingertips, cut in margarine until mixture is crumbly. Stir in egg and molasses. Form dough into a ball, adding a few drops of water if needed. Roll dough out on a floured work surface to 1/2-inch thickness. Cut into desired shapes. Place on a greased baking sheet. Bake at 375°F (190°C) for 20 minutes or until lightly browned. Cool on wire rack.